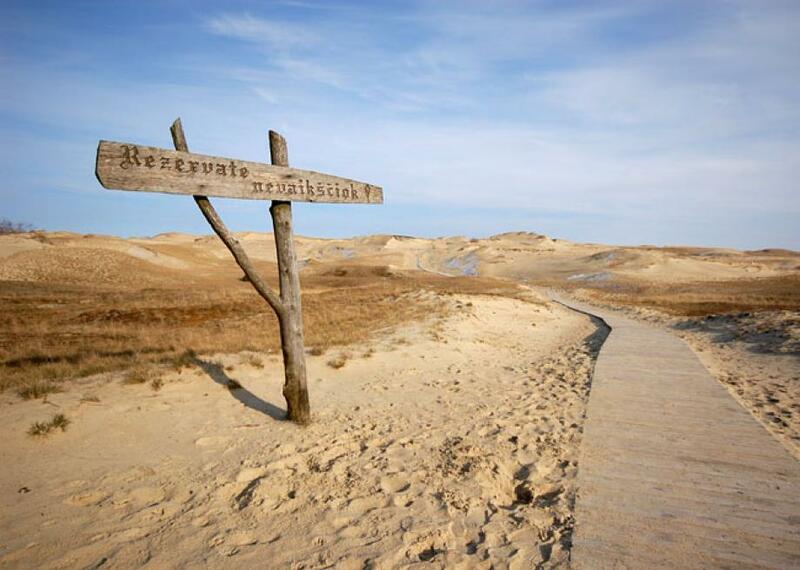 The Dead Dunes in Pervalka, Lithuania, are the tallest migrating dunes in Europe. Built by winds and sea currents, the Curonian Spit is a ribbon of sand separating the Curonian Lagoon from the Baltic Sea. The barrier bar has been designated a national park by both Lithuania and Russia. As a protected area within a protected area, the Dead Dunes are one of the most dramatic and botanically significant features of this unique geological formation. Ranging up to 60 meters in height, the Dead Dunes still obscure four villages and two cemeteries that were swallowed by the shifting sands between 1675 and 1854, when the dunes were travelling 0.5 to 15 meters per year. Human activity on the Curonian Spit—also known as Neringa—dates back to at least the 9th century A.D. and was subsequently occupied by the Teutonic Knights, whose presence led to increased grazing and logging. The resulting deforestation created a more transient landscape of sand dunes that warped and migrated with the prevailing westerly winds. Reforestation efforts began in the 19th century and were largely successful. The Dead Dunes provide a glimpse of an unreconstructed stretch of Neringa. Declared a UNESCO World Heritage Site, the Dead Dunes moniker is a striking misnomer; the area comprises the Nagliai Nature Reserve, an ecologically sensitive region home to multiple rare and fragile plants. The unique flora overall provides a muted, earth-toned appearance, making the area’s alternate name, the “Grey Dunes,” make a bit more sense. Visitors to the Nagliai Nature Reserve are obliged to stay on the marked trail, in order to avoid disrupting the peculiar and delicate ecosystem.